Indian dhurrie rugs have been woven by hand in India for thousands of years and it is a skill that has been passed though families for generations. All of our dhurries are woven in the small villages scattered across the countryside outside Jaipur. It is the farming community who typically weave as a means of supplementing their agricultural income. Our weavers work on the farm in the morning and weave in the afternoons. 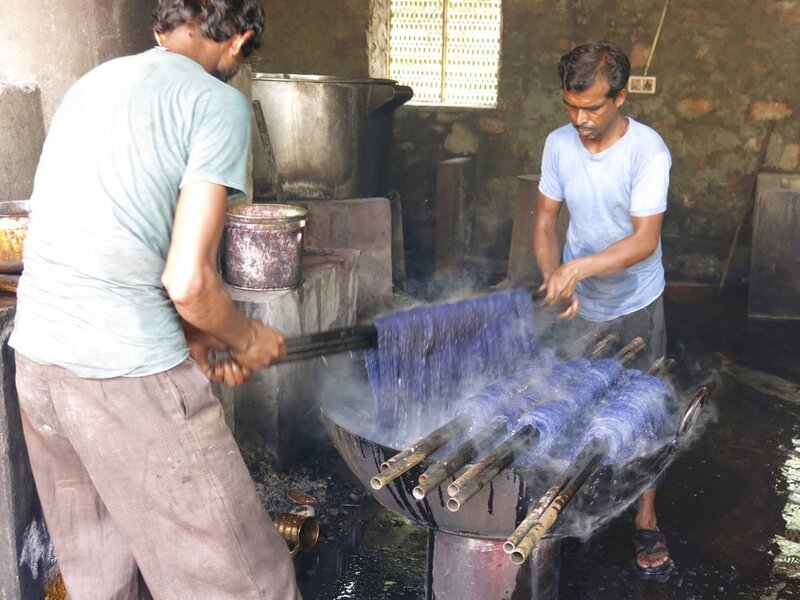 All the dying is done by hand by our Dye Master Jogander and his assistant Nanag. The dyes are measured by eye and then added to a vat of boiling water, with the addition of setting agents. The yarn is then plunged in and out of the bubbling hot dye until the correct colour is achieved. Then rinsed through with water and hung to dry in the Rajasthani sun. Kesar and Puni are the girls responsible for spinning the cotton or wool, creating a 20 count thread to make the yarn, which is then spooled ready for weaving. Probably one of the most important steps of the whole process, the loom. The warp is made ready for weaving and precision is key in order to make the perfect rug. A real labour of love. 2 - 3 weavers will weave a few inches each day until the rug is complete. It is vital that the weavers working on the rug apply the same amount of pressure so that the rug is even on both sides. After spending around a month in the dusty Rajasthani countryside you can imagine the dhurries need a bit of a clean. Itukum, Moti and Mohan are the washing team and make sure each rug is spotless. The dhurrie is then taken to be checked and the finishing touches such as fringing, pom poms or tassels are added.